ECHINODERMATA : OPHIURIDA : Ophiactidae STARFISH, SEA URCHINS, ETC. 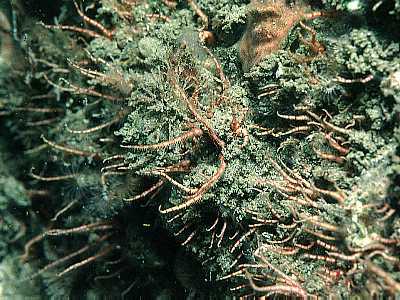 Description: A small brittle star with arms conspicuously banded with widely spaced red-brown bands. The disc is covered with red scales, some of which bear small spines. There are 4-6 arm spines, the lower ones somewhat flattened. The dorsal surface of the arm bears a series of large plates and there is a single tentacle scale. Disc 5mm. arms 6x disc diameter. Habitat: This species is generally found in crevices or amongst sessile invertebrates, where the body is concealed and the arms are extended out into the water. It is characteristic of exposed or moderately exposed rocky situations especially on limestone. Distribution: South and west coasts of the British Isles and North Sea coasts as far south as Northumberland. More common in the south. Similar Species: Ophiopholis aculeata is similarly coloured and lives in the same habitat but is larger and coarser. Small size, pale arms banded with red. Picton, B.E. & Morrow, C.C. (2016). Ophiactis balli (Thompson, 1840). [In] Encyclopedia of Marine Life of Britain and Ireland.